Carolyn asked: How do I remove oil from lotion from finished wood? There are streaks and areas on my wooden desk, and a bench that is partly cloudy. I can’t seem to get them clean. I believe that the marks come from hand lotion that was applied shortly before touching the wood. I may my own cleaning agents at home. The multipurpose mixture of water, white vinegar, borax and a mild dish soap. The wood cleaner is diluted Murphy’s Oil Soap. Neither of them are working to remove the streaks. Any ideas? Thanks so much! 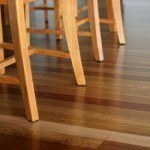 Lotion stains can be surprisingly difficult to remove from all types of surfaces, including wood. Cleaning them will take a bit of elbow grease, but with a good effort, you should see results with this method. Add a good amount of dish soap to hot water in a bowl. Agitate the water until you’ve created a large amount of suds. Dip one clean cloth in the suds (not the water). Use the cloth to scrub the suds into the wood. Wipe clean with a second cloth moistened with cool water. 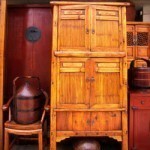 When the stain has been completely lifted from the wood, dry it thoroughly. Apply a wax or polish to protect the finish. On some wood finishes where the lotion stain is relatively new, you can try laying a piece of blotting paper over the stain. Heat the spot with a warm iron for just a few seconds at a time to avoid scorching the wood. Repeat as necessary. Avoid using abrasive cleansers. They may damage the surface or finish of the wood. I just bought a beautiful wood dining table. It is getting dull and stained all around the edge of the table where our arms/hands touch the wood. I cannot get the smudges out and hate to use a table cloth and hide the wood. What can I use to get these smudges off?! 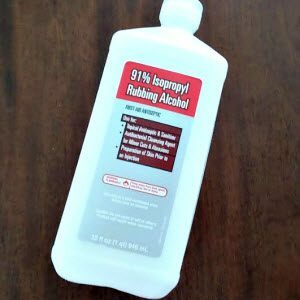 Hi there, if cleaners and products like Murphy’s is not working, try 91% rubbing alcohol on a lint-free white rag trying a small spot in an inconspicuous area on the table. Let it dry and make sure your not melting the clear coat or discoloring the stain color coat. If that doesn’t work, buy a quart of mineral spirits and use the same method. Always have plenty of lint-free rags to keep your table surface nice. If you have any container stains like a sweaty glass dark circle stains on your table top, use a film of straight bleach and let it sit until your wood looks new and there’s not a stain on it. Make sure after you get the results you want with bleach to wipe the surface with clean water with the grain until the bleach is washed off and then dry the surface with lint-free rags. CAUTION: bleach wood when you’re home and you can keep an eye on it. Sometimes the surface will look like brand new in a few hours. Shower leak. Went in to bedroom. Press wood wet. Under pad and carpet. Pulled pad and carpet up and threw them away. Now, meldew smell. How do I get rid of the smell without putting more water on the wood? Use an odor absorber, such as baking soda or charcoal briquettes, both of which will also work as moisture absorbers for the area and help to kill the mildew (mildew requires moisture to grow, so by removing the moisture it will die). This can be done either by a couple bowls of baking soda or a bucket/bowl of charcoal briquettes in the area. For moisture removal, a DampRid container can also help. Good luck! From almost 60 years of use, the areas around the drawer pulls on my dresser are shiny — probably from natural skin oil. How do I clean these areas safely? 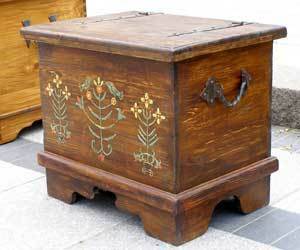 The dresser is still beautiful. I want to save it from looking 60 years old! 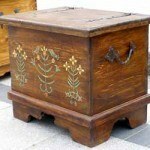 My furniture is oak and some of it has a shiny finish to it, others have just a nice finish but without the shiny bit. I did notice what looked like oil stains on some of the furniture and glass marks that would not go away using just a towel and water. Please advise how I can remove them without any damages. 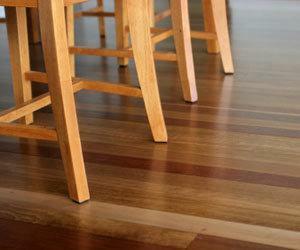 It sounds like your furniture may have several different types of finishes. 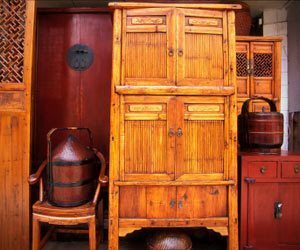 The methods here can work to remove almost any type of oil stain, but be sure to test any new method on a small hidden area of each furniture piece before using it to be look for any adverse reaction. Good luck! I have a new coffee table and end table that has a few shiny burned-ish spots on them that are driving me crazy. How do I remove them without damaging the tables? I believe they are surfaces stains. Please help. Hi there, if the spots on your table look like water glass or beer bottle stains, try bleach straight out of the gallon on a lint-free rag and wipe a wet even coat on the surface. Do this outside on a day you can watch the progress of the bleach. If the marks disappear immediately, wipe the bleach off with a wet lint free rag until the bleach feels washed off and wipe dry. If the surface looks dried out after drying naturally, pick up a quart of oil-base POLYURATHANE Minwax in whatever gloss you prefer and apply the thinnest coat you can stretching the 2 inch natural bristle brush very dry before dipping your brush for more poly. Make sure you keep a wet edge going from L to R or R to L. be sure you leave the surface alone after finishing it. Attempting to touch it up wet will ruin the surface. Wait until it dries and you sand it with 400 grit. Good day, I hope that you can help me. I have a dark wood table that I messed wood stain on. It is shaped like a half moon and it has gone into the wood. How do I remove this? The best method in this case is probably to try using some furniture refinisher on a steel wool pad. Usually, the main methods of removing wood stain are by either sanding the wood or by applying a chemical paint stripper and then scraping it off (such as with a paint scraping tool), however, since you stain is only in one area, those methods might leave the wood uneven. Instead, try the refinisher and steel wool method used in the article How to Remove Stain Without Sanding by Confessions of a Serial Do-It-Yourselfer. You can also try sponging with some isopropyl alcohol to see if that can get it up. Good luck! An oil diffuser tipped over onto my wooden table, taking the colour out. I’m unsure how to treat it. My problem started when my glass that I had on top of my dark wood table broke, I noticed that there were shiny spots from where the little circular disks were under the glass. I used table top wax paste, but now I cannot seem to buff it out enough. There are streaks and I cannot seem to get rid of them. I really don’t want to have to use a table cloth, it is such a gorgeous table! Please help. I can send pictures if you need to see. Thank you. Someone told me to use mineral spirits to clean the table, I always thought mineral spirits will ruin the finish.